Stack question on interactions with madness and Vengevine. Whenever you cast a spell, if it's the second creature spell you cast this turn, you may return Vengevine from your graveyard to the battlefield. Thanks for the comment and suggestions. So, while all the cards you name are good cards, they are not right for this deck, and really I think you give me a good chance to highlight the difference between a good sideboard card in general, and a good sideboard card in Ad Nauseam specifically. Mindbreak Trap I will agree is a great card for storm, however it is very surplus to requirements in this deck. I feel people have this misconception about storm as being this turn 3 combo deck when that really isn't the case, ideally storm will be going off on turn 5 or 6 if they can get there, by this time they should have crafted a bulletproof hand, to go off turn 3 is a high risk play unless they have it and you aren't going to beat storm when it has it anyway to be honest, we are very effective at forcing them to try, likely when they aren't 100% comfortable; going earlier increases the chance of fizzling dramatically. Additionally, storm is already a good matchup, I would say that its probably about 70-30 for us, meaning that to hedge for storm is generally incorrect (though it must be said storm is one of those decks where the best storm pilots are always going to be difficult to beat). 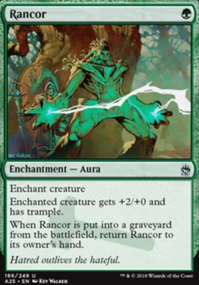 The main reason for this line of thinking is Angel's Grace and to a lesser degree Phyrexian Unlife ; essentially the storm player needs to be able to set up a turn where they can both Grapeshot and Empty the Warrens to realistically expect to win and fight through our ability to stay alive. In other words, while a good card, considering the matchup is a good one it is largely unnecessary (though probably a consideration if your meta is all storm). To this end, the other card you suggest Ravenous Trap suffers from the same problem. It is a great card, however the matchups it is best against, Dredge and Phoenix, are both favorable (I personally have a winning record against Phoenix however it still hasn't been around long enough for me to make a formal decision on how good the matchup is for us) already. This is a case scenario where, although the card is great, there is no real reason to play it in the deck as it attacks decks that we should beat anyway. In other words, to play the card is to use a slot for a good matchup, something that I can't get behind unless the card has implications for bad to even matchups (say if Jund Vengevine were a bit more popular and playing more discard effects). All in all, like Mindbreak Trap it's a great card but not needed here as it doesn't attack mathcups we really need to fear. As for Solemnity , every once in a while you actually do see an Ad Nauseam player running it whether in the side or even the main, exploiting the lack of enchantment removal currently seeing play, the only real cards seeing some play being Nature's Claim and Assassin's Trophy .It isn't awful, but... it's just too gimicky for my tastes. The big question with it is, what do you cut? What card in the deck is significantly worse than Solemnity and in what matchup will you ever actually get it down where it matters: Storm, 8-whack, zoo, humans, infect, affinity, and spirits are all too fast; then that leaves the relevant matchups of Phoenix, Dredge, Hollow One, and Merfolk really. All of which, bar Hollow One game one, are already good matchups and, building on that, Dredge and Hollow One, where it is perhaps most useful, have hate for it, Dredge always siding in some number of Nature's Claim against us, and Hollow One sometimes dipping into green for Assassin's Trophy . To me the combo there doesn't play enough and quite frankly feels like a bit of a wasted slot. So while fun, and don't get me wrong it would be really fun to get someone with it, I don't think that it is the best thing you can be doing, I would rather have that slot be something better against a bad matchup, or something more flexible that doesn't require me to draw exactly those two cards. 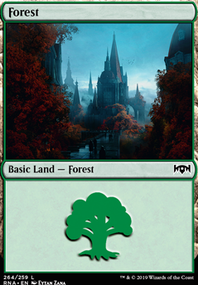 Thank you for the comments, I'll definitely add Solemnity to my Sideboard Options List for people's reference, though I don't see myself playing it. I hope I have explained myself adequately. Instead of undying/persist which was suggested above, why not go for Vengevine . Thanks to the reprint they are only ~$12 a piece. Play Vengevine , use either Eldritch Evolution or Metamorphosis . 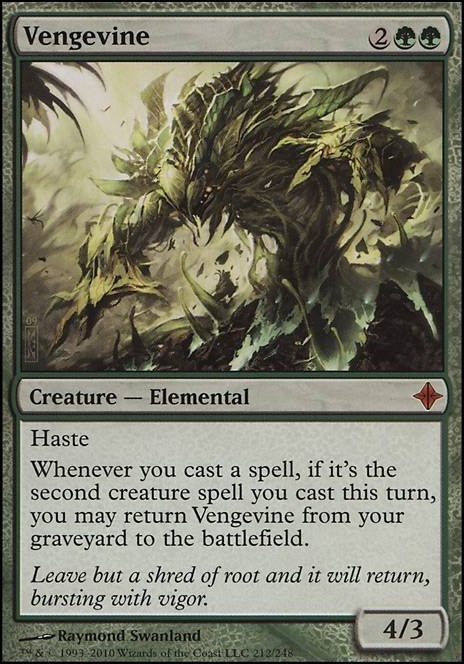 If you use Metamorphosis and then cast a creature with the mana from Metamorphosis that will pull Vengevine back into play (assuming this occurs the same turn you cast Vengevine ). May cost a few extra $$ but it would be significantly more competitive and as far as Legacy goes would be quite budget still. This looks loads of fun, but you might be playing it at the wrong time. It's almost guaranteed that your opponent has graveyard hate, given decks which use; Stinkweed Imp , Bloodghast , Living End , Vengevine , Hooting Mandrills , Arclight Phoenix , Flamewake Phoenix , Bedlam Reveler , Striped Riverwinder and more all exist. You might be better playing like the spirits aggro list with; Supreme Phantom Selfless Spirit and Spell Queller and switch to the Mortal Combat / Iname, Death Aspect plan from the sideboard, if you did that I'd also stick Nether Traitor in for either, free hits or removal bait. On its own Nether Traitor won't warrant the grave hate so hopefully your opponent sides it out. Hope this helps, good luck brewing your deck. 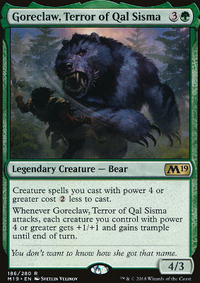 This feels more like the Vengevine variant, due to your volume of creatures, though that card is rather pricey... Also a quick note on Simian Spirit Guide, it exiles itself, this is not a discard trigger, so while it will give you extra mana it won't add to your discard count. With your build I'd be tempted to run 4x Vexing Devil and 4x Claim / Fame, to make the space -4x Monastery Swiftspear and -2x Call to the Netherworld -2x Maximize Velocity. That's some quick thoughts, hope they help, I run a different (to yours) take on Hollow One, if your intrested see Power 4 is Ferocious. Good luck with your brew. personally i like your choices against control. Sigil of the New Dawn is very nice, because, despite its low price, it has never been reprinted, and the new artwork looks great. I am not particularly pleased about the reprint of Containment Priest, because I feel that that card is too inexpensive for such a powerful effect (it really should have cost 3 or 4 mana for that effect). Angel of Despair is one of my favorite angles in the game, so her being reprinted is always nice; I would have preferred to see her with new artwork, but her current artwork is so awesome that there is no real need to replace it. Why was she demoted to an uncommon? She is far too powerful to be anything less than a rare, in my mind. I really would like to see all ten lieges (but most notably Balefire Liege and Deathbringer Liege) from Shadowmoor and Eventide reprinted, becuase many of them need to be reprinted. Ertai, the Corrupted would also look very nice in the new frame style, as well. 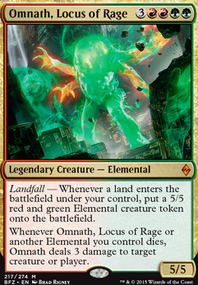 Pattern of Rebirth and Spoils of the Vault were not particularly expensive, but their new artwork is very nice. 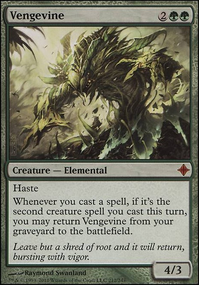 I did not realize that Vengevine had become so expensive, so it being reprinted in this set is very nice, indeed.